Liu, C., Lin, K., Chang, T., and Chang, F. (2019). "Preparation and characterization of moso bamboo-based cellulose nanowhiskers under various acid hydrolysis conditions," BioRes. 14(1), 1077-1090. The influence of acid hydrolysis conditions on cellulose nanowhiskers (CNW) made from moso bamboo (Phyllostachys edulis) was investigated in this study. Procedures with or without an alcohol–toluene extraction were tested using different acid concentrations and hydrolysis durations. The alcohol–toluene extract had no significant effect on the properties of bamboo cellulose nanowhiskers (BCNW). According to the results, a sulfuric acid concentration of 46% with 2 h of hydrolysis and a concentration of 55% with 1 h of hydrolysis were ideal for preparing BCNW because the product had a relatively high crystallinity index. In addition, the surface functional groups of the products obtained from different sulfuric acid hydrolysis conditions were similar. However, groups treated with lower acid concentrations exhibited slightly stronger thermal stability than those treated with higher acid concentrations. Cellulose is a sustainable bio-resource that is abundant in nature. Due to its promising physical and mechanical characteristics, cellulose fiber is currently receiving global attention in the material science field, particularly regarding the exploration and application of microscale and nanoscale cellulose fibers for industrial use. 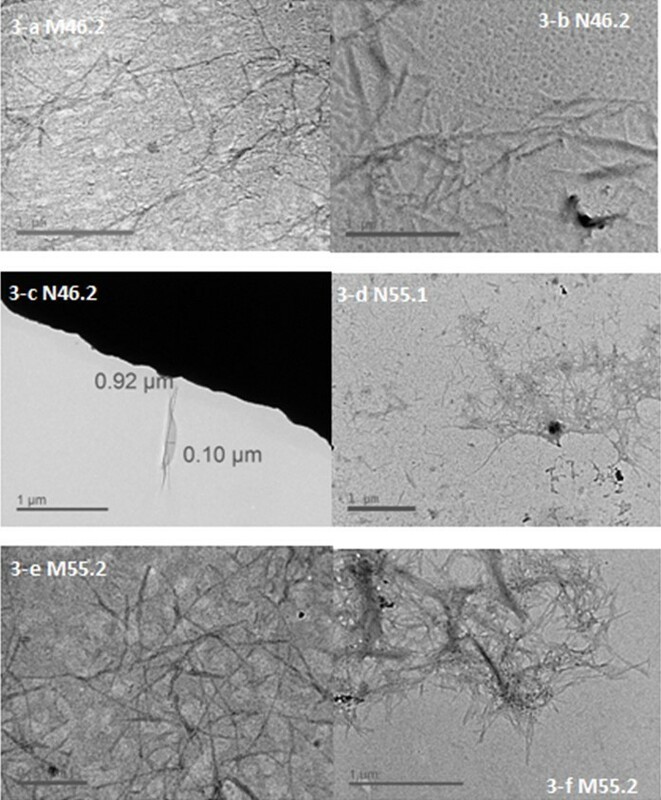 Future efforts should be made to develop new nanoscale cellulose fiber-based products. This may lead to the development of green materials and further applications. Nanowhisker is a type of filamentary crystal (whiskers) with a cross sectional diameter ranging from 1 to 100 nm and length to diameter ratio greater than 100. Cellulose nanowhiskers (CNW), which are also commonly called cellulose nanocrystals (CNC) and nanocrystalline cellulose (NCC) (Eichhorn 2011), are extracted from crystalline regions of cellulose through hydrolyzation of the amorphous region and have a highly crystalline appearance. Because of their large surface area and various unique properties, the potential application in optical elements, regenerative medicine, automotive uses, cosmetic skin masks, and tissue engineering scaffolding have been widely discussed (Huang et al. 2003; Yoko et al. 2009; Eichhorn 2011; Yu et al. 2012; Gao et al. 2013). Bleached kraft pulp (Hubbe et al. 2008), agricultural waste (Hubbe et al. 2008; Moran et al. 2008), bacterial cellulose (Yano et al. 2005; Hubbe et al. 2008), and bamboo (Yu et al. 2012) have all been studied as cellulose sources for CNW. Because bamboo grows faster than wood, it may be an ideal replacement for wood as the raw material for CNW production. Similar to wood, the main chemical component of bamboo is cellulose (57% to 66%) (Yang et al. 2008), suggesting the potential of bamboo as a raw source material for CNW. Moreover, bamboo is abundantly available and is a sustainable source for CNW production. Using bamboo as the raw material for CNW could also avoid competition for a cellulose supply from other fields such as the pulping and paper-making industries. In addition, the development of bamboo-based CNW (BCNW) for various applications can benefit the environment by substituting for other energy-consuming and carbon-emitting materials. Several studies about this topic have been published (Chen et al. 2011; Brito et al. 2012; Ma et al. 2013; Hu et al. 2014). 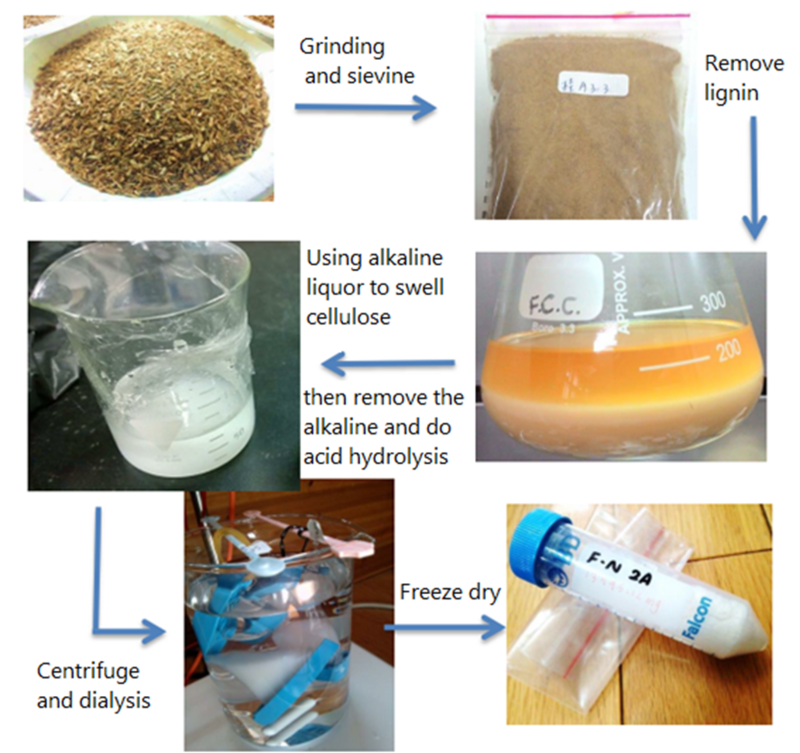 Possible methods for preparing BCNW are acid hydrolysis, enzymatic hydrolysis, oxidation, high-pressure homogenization, and the steam cracking process (Zhang et al. 2014). Sulfuric acid, hydrochloric acid, phosphoric acid, and a mixture of acetic acid and nitric acid are applied in acid hydrolysis (Zhang et al. 2014). The resultant products exhibit different properties corresponding to the hydrolysis conditions, particularly regarding acid concentration and hydrolysis time (Beck-Candanedo et al. 2005). However, the influence of preparation conditions on the properties of products is raw material-dependent. This study employed sulfuric acid hydrolysis to isolate BCNW from native Taiwanese moso bamboo (Phyllostachys edulis) after its chemical pre-treatments. The processing conditions of sulfuric acid concentration, hydrolysis temperature, and duration were investigated to clarify the effectiveness of their variations. Moreover, the properties of outward appearance, surface functional groups, crystallinity index (Cr.I. ), and thermal degradation temperature were compared with those of a commercial CNC product in order to evaluate the optimal procedure and conditions for BCNW fabrication. The moso bamboo (Phyllostachys edulis) used in this study was collected from the Shuili tract of the National Taiwan University Experimental Forest, Nantou, Taiwan, and then processed as chips with the size approximately 4 × 2 × 1 mm3. To obtain relatively pure BCNW, an alcohol–toluene extraction treatment was applied, followed by an acid chlorite treatment to obtain holocellulose. Alkaline treatment was used to remove the remaining impurities. A mixture of toluene and ethanol for the alcohol–toluene extraction method was prepared by mixing ethanol (95%) with toluene (Echo Chemical Co., Ltd., Miaoli, Taiwan) at a volume ratio of 1:2. An acidified sodium chlorite solution was created using a mixture of sodium chlorite (Showa Chemical Co., Ltd., Osaka, Japan) and acetic acid (95%). Also, 3% (w/w) sodium hydroxide (Showa Chemical Co., Ltd., Osaka, Japan) was used. The three sulfuric acid solutions were prepared in sulfuric acid (Scharlau, Barcelona, Spain, 95% to 98%) at concentrations of 46%, 55%, and 64% (w/w) mixed with distilled water. The overall processing procedures are illustrated in Fig. 1. The products were examined using a series of measurements. As illustrated, pretreatments were required before sulfuric acid hydrolysis. The treated time of the alcohol–toluene extraction is 48 h with 8 h break after 24 h. To ensure no residual from alcohol–toluene extraction, the alcohol extraction was conducted to wash the fiber for 24 h. With a 2:1 (v/v) mixture of toluene and ethanol, extractive-free bamboo chips were obtained using a Soxhlet apparatus. Then, they were treated using an acidified sodium chlorite solution at 75 °C. One gram of sodium chlorite powder and 1 mL of acetic acid (95%) were added every hour until lignin in bamboo was completely removed and became bamboo holocellulose. The bamboo holocellulose was treated using 3% (w/w) sodium hydroxide at 50 °C for 2 h to remove the fatty acids, residual lignin, hemicellulose, resin, and other impurities. Simultaneously, the amorphous regions of cellulose swelled, improving the effectiveness of subsequent acid hydrolysis. 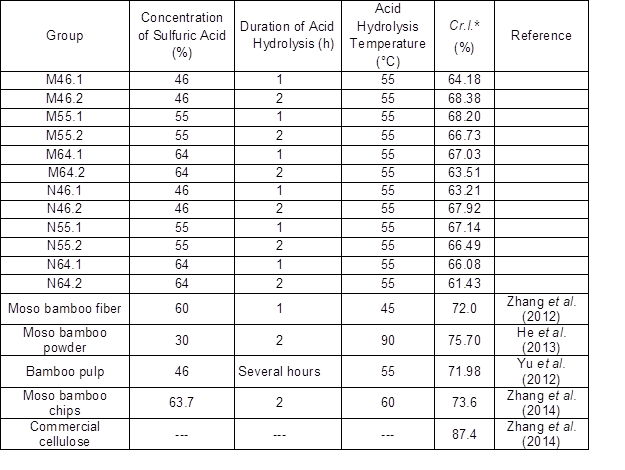 The sulfuric acid hydrolysis conditions are listed in Table 1. BCNW products were obtained through acid hydrolysis with a 1:10 (g/mL) ratio of the dry weight of bamboo cellulose to the acid solution. Following hydrolysis, 100 mL of distilled water was added to stop the reaction. The suspension was transferred to a 50 mL falcon tube, washed with distilled water, and treated with centrifuge cycles of 5,000 rpm for 10 min at least three times at 4 °C. The resultant BCNW suspensions were dialyzed with water for a specified time until the pH value was approximately 6. Finally, after the suspensions were ultrasonicated for 20 min (Crest Ultrasonics Corporation, Ewing Township, NJ, USA), BCNW powders were obtained through freeze-drying (Kingmech Co., Ltd., New Taipei City, Taiwan). *The letter M means sample treated with the alcohol- toluene extract treatment and N means samples without the alcohol-toluene extract treatment. The first and second number mean the sulfuric acid concentration and duration of acid hydrolysis. The properties of BCNW obtained under each condition were measured. Transmission electron microscopy (TEM; JEOL JEM-1200EX II, Tokyo, Japan) was used to observe the morphology and aggregation status of the BCNW as well as to measure their dimensions. Furthermore, the functional groups of the BCNW were analyzed using diffuse reflectance infrared Fourier transform spectroscopy (FT-IR; BIO-RAD FTS-40 FT-IR spectrometer, Hercules, CA, USA). The spectra were recorded in the range of 4000 to 400 cm-1. For the structure of the crystalline regions, Cr.I. values were determined using an X-ray diffractometer (X’ Pert PRO, PANalytical, Almelo, Netherlands). BCNW powder were used, and the scan range was from 5° to 35°. The Ruland-Vonk X-ray diffraction method (Terinte et al. 2011) was applied to calculate the Cr.I. values using the ratio of the area of the crystalline phase to the total area. 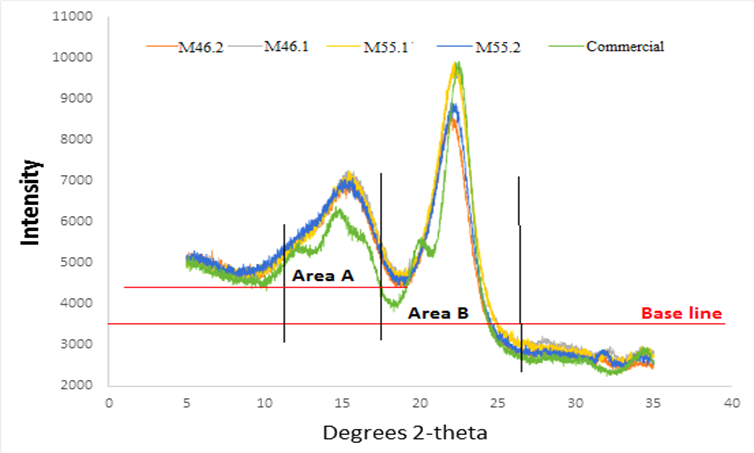 The thermal degradation temperature of the BCNW were investigated using a thermogravimetric analyzer (TGA, METTLER, TGA/SDTA-851, Columbus, OH, USA) through monitoring the temperature-dependent weight loss. The test range was from 80 °C to 800 °C and heating rate was 20 °C / min. Moreover, a commercially available CNC product purchased from University of Maine was also investigated as the reference. After freeze-drying, the BCNW products appeared powder-like, as shown in Fig. 2. The products obtained under higher sulfuric acid concentrations exhibited a darker color than those that were treated with a lower acid concentration, which might have been caused by the dehydration catalyzation of the sulfuric acid (Kim et al. 2001). Yu et al. (2012) also observed that an increased acid concentration and hydrolysis time causes the color of the product to change from white to yellow or even black. Yu et al. (2012) also indicated that a long hydrolysis time may cause cellulose to be completely degraded. In this study, a strong acid concentration and long hydrolysis duration resulted in a low yield of products. Consequently, proper hydrolysis conditions should be carefully considered for BCNW production. The BCNW was prepared according to conditions listed in Table 2 and exhibited varying appearances under TEM, as presented in Fig. 3. In general, the length range of the resultant BCNW were 0.5 to 2 μm, which is longer than that of the commercial CNC, indicating a relatively high aspect ratio compared with those initially expected. 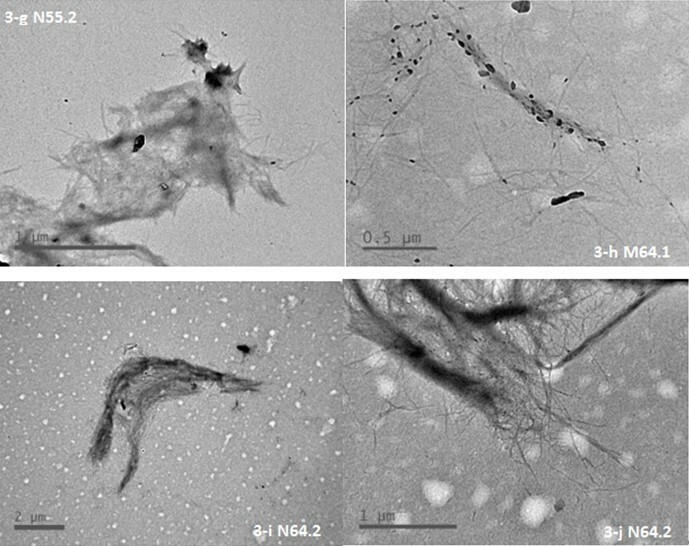 Moreover, the images indicated that a greater number of long fibers existed than short-rigid rod-like fibers, implying the possibility that amorphous regions remained in the products after acid hydrolysis. However, the variation of the length distribution for the products was broad within each group, and a noticeable aggregation was observed in the TEM images, hindering precise measurement of their dimensions. 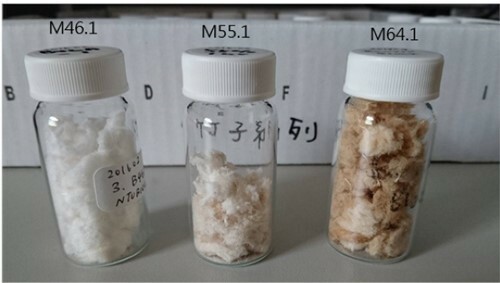 After undergoing acid hydrolysis for 1 h, some products remained in a spindle shape, whereas others aggregated into large fiber bundles, and some dark particles were observed. However, BCNW prepared with a hydrolysis duration of 2 h exhibited only aggregated products, implying relatively poor dispersion. Furthermore, winding net or mesh structures, which were contributed by the aggregation of the products, were observed in the samples prepared with an acid concentration of 55% (w/w). The length range of N55.1, M55.1, and N55.2 was approximately 0.3 to 0.5 μm. However, the BCNW prepared using 46% (w/w) acid hydrolysis for 2 h (Fig. 3-a, 3-b) had relatively even lengths and fewer aggregated forms. Although the length range of M46.2 and N46.2 was 0.5 to 1 μm, which is still larger than that of the commercial CNC (0.1 to 0.2 μm), using 46% (w/w) acid concentration is our recommendation for preparing low-aggregated and clearly white products (Fig. 2). The Cr.I. values of the produced BCNW were measured using a wide-angle X-ray diffractometer. Some representative results are illustrated in Fig. 4, and the Cr.I. values are listed in Table 2, which also includes some results from similar studies as a reference. The results showed two strong peaks at angles ranging from 15° to 16° and 21° to 23°, suggesting the presence of a cellulose I structure. However, due to the unremoved amorphous regions, the Cr.I. values of the produced BCNW (61% to 68%) were considerably lower than that of commercial CNC (approximately 76%) (He et al. 2013). *The Cr.I. was calculated by the area of region B over the area sum of region B and region A shown in Fig. 4. Furthermore, the BCNW prepared using a 46% acid concentration with 2 h of hydrolysis or a 55% acid concentration with 1 h of hydrolysis exhibited relatively high Cr.I. values, ranging from 67% to 68%, implying that a specific hydrolysis duration is required to remove amorphous regions when the acid concentration is relatively low. For low concentrations, hydrolysis can remove amorphous regions, but this is a slow method of dehydration for bamboo fiber. In addition, with increased hydrolysis durations and acid concentrations, the crystalline regions of the raw material were damaged, resulting in relatively low Cr.I. values. Although a lower concentration was indicated as better for acid hydrolysis, further study is required to investigate efficient production of BCNW with a suitable ratio of acid solution to the dry weight of bamboo holocellulose, which is essential for efficient large-scale production. 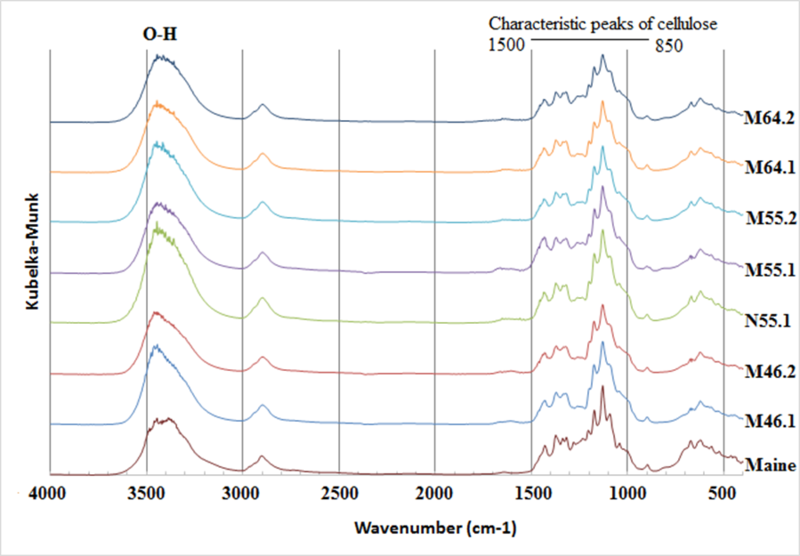 Figures 5 and 6 show the FT-IR spectra of various treated groups. Peaks at 700, 1100, 1400, and 3500 cm-1 represented linkages of C–C, C–O, and O–H. In addition, the peak at 2900 cm-1 indicated the stretching of C–H. Characteristic peaks of cellulose were observed between 850 and 1500 cm-1. 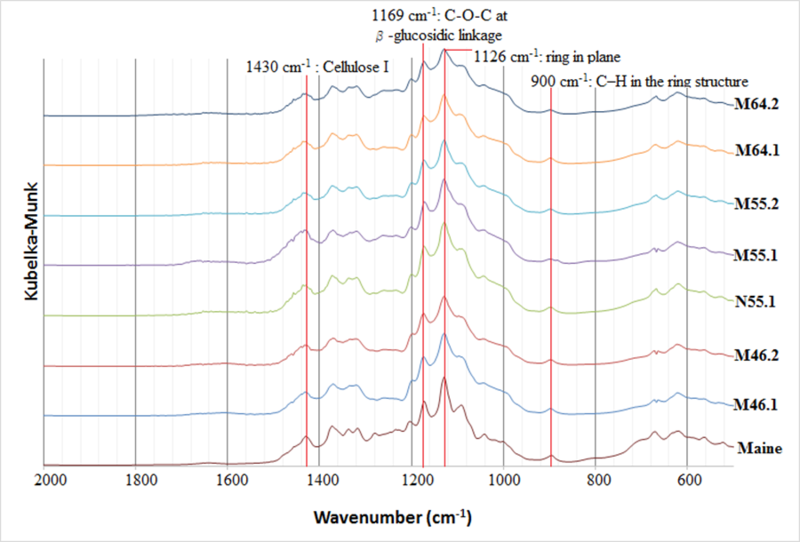 According to literature, the absorption peak at 1058 cm-1 corresponded to the C–O at the C-3 position of cellulose, and the peak at 1126 cm-1 was the signal of the ring in the plane of cellulose. The peak at 1169 cm-1 was the signal of C–O–C at the β-glucosidic linkage, and the range of 1200 to 1236 cm-1 was the signal of C–OH in plane at C-6. The peak of C–H in the ring structure was 900 cm-1, and celluloses with peaks at 1400 to 1430 cm-1 are referred to as the cellulose I and cellulose II (Nelson and O’Connor 1964; Oh et al. 2005). Moreover, based on Figs. 5 and 6, the all BCNW groups exhibited similar spectra, indicating the functional groups of BCNW treated with various hydrolysis conditions were similar. Besides, the positions of the absorption peaks of N55.1 (Figs. 5 and 6) were similar to other BCNW groups, indicating alcohol–toluene extraction did not affect the changes of the functional groups of BCNW products. Moreover, alcohol–toluene extraction also did not result in considerably different BCNW products in terms of their dimensions (Fig. 3) and Cr.I. values (Table. 2). Fig. 5. Representative FT-IR spectra of BCNW in different conditions. The BCNW obtained using different conditions showed two-stage degradation, as illustrated in Fig. 7. 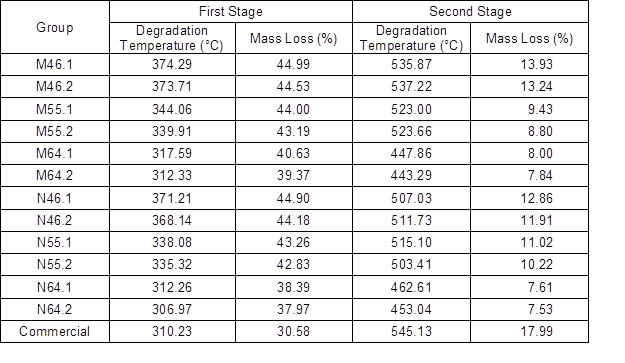 The degradation temperatures are listed in Table 3. In contrast, the commercial CNC merely exhibited one-stage thermal degradation in this study, at 310.2 °C. A lower degradation temperature for each stage was observed along with a stronger condition, such as a higher acid concentration and longer hydrolysis duration. The first-stage degradation temperature of each group was higher than 300 °C, which was close to that of the commercial CNC. A previous study that used phosphoric acid to conduct hydrolysis indicated that the thermal degradation temperature of bamboo CNC is approximately 324 °C (Lu et al. 2015). 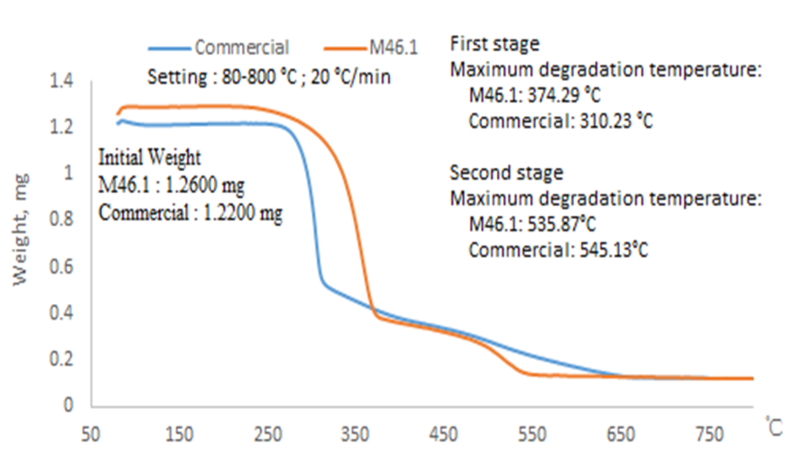 The mass loss that occurred at the first stage of degradation was approximately 35% to 45% of the products in weight ratio (Table 3). Then, the second stage of thermal degradation of BCNW started higher than 450 °C, resulting in a mass loss of approximately 7% to 14% of the BCNW. The thermogravimetric analysis showed that products treated with lower acid concentrations displayed slightly better thermal stability than those treated with higher acid concentrations. Because a dehydration reaction was derived using phosphoric acid, the activation energy of cellulose chain degradation was decreased (Lu et al. 2015). The groups treated with higher acid concentrations and longer hydrolysis durations had a decreased thermal stability. A result of carbonization was observed owing to the residues after the second thermal degradation. Table 3. Thermal Degradation Temperatures of BCNW. The effect of an alcohol–toluene extract treatment on the properties of produced BCNW was not found to be significant. The length ranges of resultant BCNW were approximately 0.5 to 2 μm, which were longer than those of the commercial CNC. The hydrolysis treatment with 46% (w/w) sulfuric acid for 2 h is recommended for the fabrication of low-aggregated and clearly white BCNW. An acid concentration of 46% with 2 h of hydrolysis and a concentration of 55% with 1 h of hydrolysis are suggested for the preparation of high-crystalline BCNW. The surface functional groups were similar across acid hydration conditions in this study; however, the groups treated with an acid concentration of 46% displayed slightly higher thermal stability than did those treated with concentrations of 55% and 64%. This work was financially supported by the “Advanced Research Center for Green Materials Science and Technology” from The Featured Area Research Center Program within the framework of the Higher Education Sprout Project by the Ministry of Education (107L9006) and the Ministry of Science and Technology in Taiwan (MOST 107-3017-F-002-001 and 104-2311-B-002-020-). Moreover, the authors thank the Taiwan Forestry Research Institute and Professor Shang-Tzen Chang and his research group members for their great technical assistance. Kim, D.-Y., Nishiyama, Y., Wada, M., and Kuga, S. (2001). “High-yield carbonization of cellulose by sulfuric acid impregnation,” Cellulose 8, 29-33. Article submitted: September 12, 2018; Peer review completed: November 5, 2018; Revisions accepted: December 7, 2018; Published: December 12, 2018.